If you'd like to play a Spriggan Enchanter "properly", refer to elliptic's immortal SpEn guide. 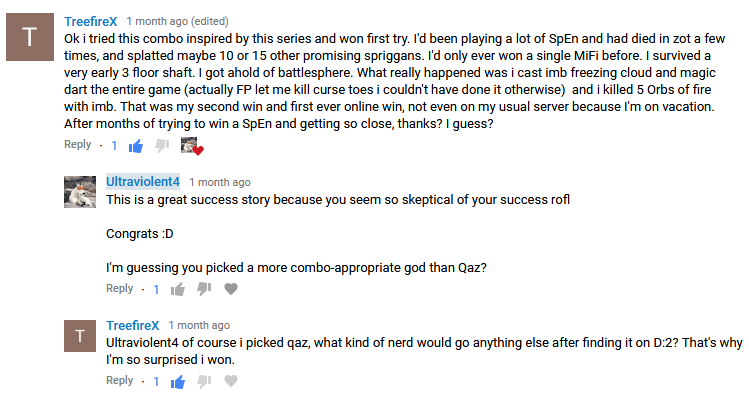 Why play Spriggan of Qazlal? Don’t. You really shouldn’t do this. If you insist, it’s probably because you’d like to do something silly and out of the ordinary. Qazlal causes a ton of noise all the time, which will pull a lot of the level to your position. This is a huge drawback much of the time and is contrary to the natural playstyle of Spriggans who excel at being sneaky. A combo like Hill Orc or Demonspawn Fighter of Qaz can try to mitigate being swarmed by being tanky and stairdancing a lot. Spriggan combos mostly try to deal with the noise by being really, really fast. UV4: Don’t even think about playing a non-Beogh Hill Orc, you heathen. Fast. Most of the monsters in the game are slower than you, including normally threatening enemies like adders, spiny frogs, hasted liches and orbs of fire. Really big, lopsided aptitudes: +4 Dodging, +2 Spellcasting, +2 Hexes, +4 Charms, +3 Evocations, +4 Translocations, +5 Stealth, among others. Huge evasion. On top of the big Dodging aptitude, they get an EV bonus from their little size and have good Dex. Fun! Spriggan is a very unique species to play. hm: “fun” is subjective. I agree that Spriggan is unique but only because I don’t play Felid ever. I mostly find Spriggans fun for doing wack conducts like this or going for ruthless efficiency (winning the game at low XL levels). Frail. -30% HP with a -2 Fighting aptitude, typically low AC due to slot and armour restrictions, poor -3 Armor skill and low Str makes it difficult to get into heavier dragon scales. Really poor aptitudes and weapon restrictions for some weapon classes. Bad aptitudes for some magic schools. Usually you can play around this but it does make the species “theoretically” less versatile. The need to kite enemies. Stand in clouds to force enemies to walk through them to get to you. You’re even immune to enemy clouds. You get a free Repel Missiles effect eventually, which is nice if you don’t feel like investing the 5 monsters’ worth of XP it takes a Spriggan to get Deflect Missiles going. While the noise is mostly a hinderance, it can also be helpful. You can attract a dangerous enemy to one stair, go back upstairs and come down a different one. Just note that if you’re intending to avoid that enemy permanently, you probably need to dive the floor it’s on lest your noise attract it once more. At **** of piety, Qazlal will sometimes give you elemental resistances if you’re hurt by something of that type. While that’s a nice bonus, you shouldn’t rely on this as a means of resistance. First, Qaz won’t always give you the resistance you most need at the right time and second, you need to be injured first. rF+ is great against a fire giant but you’re still in trouble if the first fireball took away most of your pitiful Spriggan HP. Upheaval can damage a thing anywhere on your screen. The ability creates a smite-targeted explosion that’s randomly magma, ice, air, or earth damage. Note that not every tile inside the area will necessarily be hit so Upheaval can “miss”. The explosion area becomes radius 2 at high Invocations. Elemental Force is somewhat controversial among the authors. hellmonk doesn’t like it much unless you really need allies. Ultraviolent4 uses it more, especially to block line of fire to enemy hexers but concedes it’s fairly weak early and there’s a hefty piety cost involved. Your elemental allies aren’t immune to your clouds so they tend to die very fast. Disaster Area is great to damage a whole bunch of things or to damage one thing a whole lot. Disaster Area does a number of Upheavals equal to either half your Invocations skill (randomly rounded) or the average of two random rolls between 0 and twice your Invocations skill minus 1, whichever is greater, unless there are fewer available squares to target with upheaval in which case it just targets every square it can. 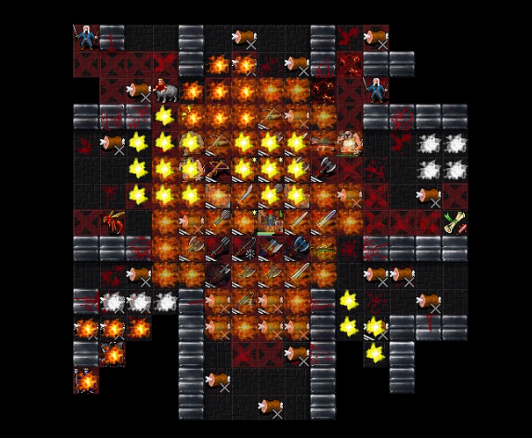 Disaster Area will never target a square where the Upheaval could damage you, but it is weighted towards targeting tiles close by and towards targeting tiles that are occupied. The ability will be more likely to hit what you want if it’s a few tiles away from you, the terrain around it is open (and ideally has other monsters), and the rest of the terrain in your line of sight is not open. In the right spot, Disaster Area is likely to hit a single monster several times for better MP, piety and turn efficiency than multiple Upheavals. You want a boatload of Invocations skill. One thing is constant, though: as a Spriggan of Qazlal, you want as much Invocations skill as you can afford. Somewhere in the realm of 18 to 20 sounds about right. Dodging is also always very strong on Spriggans due to the +4 aptitude. hellmonk trained 12 Fighting skill for 128 max HP (you need to ignore the berserk status lol). He says the Fighting skill is very expensive to train with a -2 aptitude and the HP returns are pretty lousy due to a bad base HP. hellmonk trained 0 Armour and ended up wearing a robe. In part, this is because Spriggans have naturally low Strength and he chose to put his optional stats into Intelligence to allow for the big spell plays. Ultraviolent4 trained 19.3 Fighting for 155 max HP. He says that he much prefers to play characters with lower-level spells but solid defences. Ultraviolent4 trained 12 Armour skill and put all optional stats into Strength to wear a fire dragon scales. Ending AC/EV was 20/29 but that could have been 27 AC with a fully-enchanted fire dragon scales. Spriggans have a unique experience with the food clock because they naturally hunger less due to a slow metabolism but they can’t butcher and eat corpses. As such, they depend on the Dungeon to provide rations. 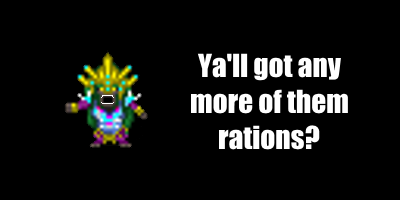 Note, however, that these rations only provide 55% as much nutrition for Spriggans as they do for regular characters. The result of all this is that Spriggans feel the effects of spell hunger more than any other species. While starvation shouldn’t actually happen unless you mess up pretty badly, you do need to keep a bit of an eye on your food situation. If, somehow, you are about to starve, it’s possible to convert to Gozag then fund a food shop. Train enough Spellcasting to not starve. Your spells don’t all have to all be hungerless but you don’t want them making you extremely hungry every fight. A Spriggan’s +2 Spellcasting aptitude is really good anyway, so you usually want to train a decent amount for spellpower and success, not to mention spell slots. Kite. Any tool with range such as a polearm, sling, conjuration, etc. will effectively give you infinite turns to kill an enemy. And, if the enemy has no range itself to retaliate, you shouldn’t ever take damage in return. A special mention is given to crossbows: while Spriggans are restricted from most large weapons because of their small size, all crossbows can be used. With a +0 aptitude in Crossbows, an arbalest-using Spriggan of Qalzal sounds reasonable if you can manage to find enough bolts. Keep an eye out for bucklers. While the -3 Shields aptitude isn’t great, a buckler can help with resistances or AC if you’re lucky enough to find a buckler of protection. A buckler is also nice with the bonus SH from Qazlal and will make you more survivable if you’re forced to stairdance due to all the noise. Try to find spells that use Hexes. Your +2 aptitude makes them very viable. Also, Confusion, Cause Fear, and Summon Mana Viper are overpowered. While summons have anti-synergy with Qazlal since they’re not immune to your clouds, the best summoning spells such as Summon Lightning Spire and Summon Mana Viper are so strong that they could still be worth it. The +4 Translocations aptitude means that Controlled Blink might actually be a viable option for a 3-Rune game. If you do manage to get this spell online, it represents a very large survivability increase (at least until you get to Zot, where the spell becomes an overpriced and uncontrolled Blink). Train lots of Stealth because you have a +5 aptitude which is tied for the biggest in the whole game. JUST KIDDING LOL - the amount of noise you make with Qazlal will wake everything up. 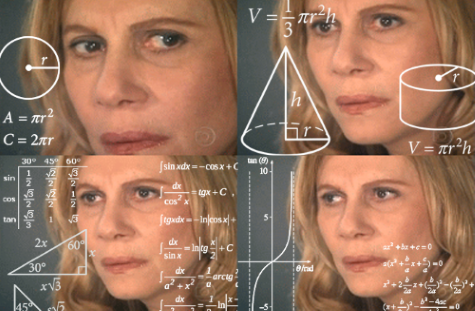 You can train Stealth if your plan is to confuse/invis/distraction stab things, since it gives you better stab damage. It’s not a “defensive skill” with Qaz, though. Spriggans are normally very good at doing Abyss due to their fast speed and stealth. This isn’t true with Qazlal because your noise will constantly pull the infinite hordes of monsters to you. Do not go there. Either Vaults 5 or the Slime Pits works fine. Disaster Area is strong at the Vaults 5 stairs and against the Royal Jelly (and you can mix in a scroll of immolation for maximum explosions). If you’re doing Vaults 5, you can use Upheaval to snipe Vault Wardens who try to lock you in. Know what things are faster than you because they’re especially dangerous. Special mention goes to killer bees, black mambas and shrikes. Also know what things can one-shot or almost one-shot you. A max-damage Lehudib’s Crystal Spear from an ancient lich can do 144 damage, for example. Where possible, stay out of range of those spells or monsters. Spirit shield on a spriggan with a lot of Spellcasting investment is like having a robust 4 mutation (+40% HP). Even if you’re dumping a lot of MP every fight, you’re still getting a significant survivability increase. Faith is also an extremely good amulet with Qazlal as it allows you to spam your god abilities. hm: If I didn’t have either of those I would use acrobat or maybe reflection or rage. I guess this is just my standard amulet advice lol. You can kill things passively with your Qaz clouds. Rather than using . to wait a turn (and risk the monster moving and then hitting you with random energy), you can perform a fast action such as wielding and unwielding a weapon. hm: Or you can just kite it lol. UV4: But what if it’s a ghost moth and an entropy weaver so you have no MP and -32 slaying?! What then?! Ultraviolent4 loves Beogh, round numbers and helping noobs. In case you haven't noticed, he runs this site. You can find Ultraviolent4's DCSS Let's Plays on YouTube.